We're very pleased with the functionality and layout of our fully revamped website at www.allaboutbathroomsinc.com. Our goal is to help our customers realize the bathroom of their dreams that provide an oasis of comfort and relaxation. All About Bathrooms Inc. is proud to announce the launch of their fully redesigned website in their ongoing commitment to provide unparalleled customer service to their clients. Customers will be able to easily navigate through the site and quickly find all of the information on bathroom remodeling that they're looking for. Clients can glean some inspiration on how they wish their dream bathroom to look by perusing the new website at http://www.allaboutbathroomsinc.com and looking through the many images taken of different bathroom remodeling projects that All About Bathrooms Inc. has completed in the past. The newly revamped website at http://www.allaboutbathroomsinc.com features an intuitive layout that will allow clients to quickly browse through the site and find the exact information that they're seeking. There are sections devoted to basic questions that customers have about the differing phases of a bathroom remodel and the associated costs, suggestions to help inspire the customer to create the perfect bathroom that suits their needs, and an extensive inventory list of recommended products that cover every budgetary range. The site features a great many images of bathroom remodeling projects that were completed by All About Bathrooms Inc., encompassing a wide range of budgets and design options. Clients can even complete a short form and attach some images in order to get a quick cost estimate for a bathroom remodeling project. 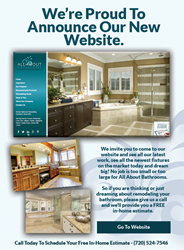 Cheryl Ince of All About Bathrooms Inc. says, "We're very pleased with the functionality and layout of our fully revamped website at http://www.allaboutbathroomsinc.com. Our goal is to help our customers realize the bathroom of their dreams that provide an oasis of comfort and relaxation. Our new website answers many common questions that people have about a bathroom remodeling project, such as what to expect from a good contractor to how an estimate is compiled. Clients can also browse through our extensive inventory of recommended products that fit every price range and design taste. I'm very proud of the section that shows the before and after images of some of our remodeling projects, which are done one at a time as we solely focus on an individual project in order to provide the highest level of quality and service. This commitment to providing sterling customer service is the guiding principle behind the design of our fully redesigned website that puts all of the pertinent information and available options in our customer's hands." About All About Bathrooms Inc.
All About Bathrooms Inc. has been providing high quality bathroom remodeling services throughout the Denver Metro area since 2001. Specializing in bathroom remodeling only, they can help make the customer's dream bathroom a reality. All About Bathrooms Inc. is unique in that they only work on a single project at a time, thus giving that project their full and undivided attention. They constantly strive to exceed the customer's expectations, and they have a highly experienced in-house design staff that can sit down and work with the client on colors, patterns, textiles, furniture, and fixtures. All About Bathrooms Inc. only uses the highest quality products in their bathroom remodeling projects and can handle any project scale, from the most basic remodel to the most luxurious. Over the years, All About Bathrooms Inc. has earned a sterling reputation for quality work, innovative designs, and integrity. For more information regarding All About Bathrooms Inc., visit their website at http://www.allaboutbathroomsinc.com or call (720)-524-7546.